PENCE: These are trying times in the life of this nation. Our economy is struggling and our national government is awash in a sea of debt. Amidst these struggles, some would have us focus our energies on jobs and spending. We must not remain silent when great moral battles are being waged. Those who would have us ignore the battle being fought over life have forgotten the lessons of history. As in the days of a house divided, America's darkest moments have come when economic arguments trumped moral principles. Pence commented that some people would rather Congress focus on economic issues, but he failed to mention that he was one of those people when Democrats held power. For instance, Pence declared in September that creating jobs "has to be the first priority and I believe will be the first priority if Republicans are given another opportunity to lead." I also believe that it will be imperative that the new congress focus just as much energy on getting our economy moving again, making sure that in the city and on the farm, Americans have more of their own hard-earned resources to invest in ways that will create jobs, so putting our fiscal house in order, creating policies that will open the doors of opportunity to families during this difficult economy and create jobs has to be the first priority and I believe will be the first priority if Republicans are given another opportunity to lead. 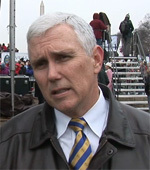 Similarly, in December 2009, Pence stated that "jobs are the number one priority of the American people, and should be the number one priority of this Congress." Like Pence, a number of leading Republicans have attacked President Obama and congressional Democrats for attempting to deal with health care — which is also a moral issue — instead of focusing all of their energy on job creation directly.